The first generation of WORMHOLES inflow control systems (ICD) on the market was a passive device having a number of advantages over competitors. Subsequent development of WORMHOLES ICD gave a new generation of ICD allowing to restrict gas rate at a predetermined level. 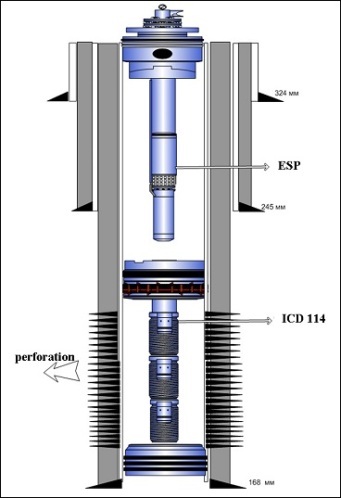 The next step was the transition from a completely passive ICD unable to change their characteristics after installation into the well to adaptive systems as well as to a system allowing to obtain quantitative information about the nature of the influx and the phase composition of the fluid from the different intervals of the well, the so-called downhole flowmeter. Now the development of downhole equipment controlled on the wellhead by electrical signal is in a final stage. - «closed» – for isolation of well intervals. - to increase oil recovery index. We have conducted research work on optimization of characteristics of adaptive inflow control system (AICD) using a hydraulic scheme on the experimental setup in Bauman State University allows to conduct research on various media (gas and liquid) in a wide range of hydraulic characteristics. A prototype of AICD was manufactured after finishing of lab tests. 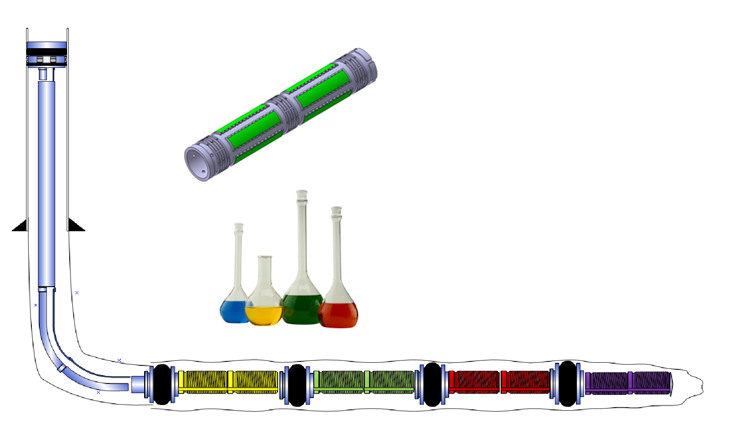 The prototype was undergo lab tests (Fig. 1) and industrial tests (Fig. 2). AICD test on heavy mud (density 1440 kg/м3) showed no wear within 85 hours. 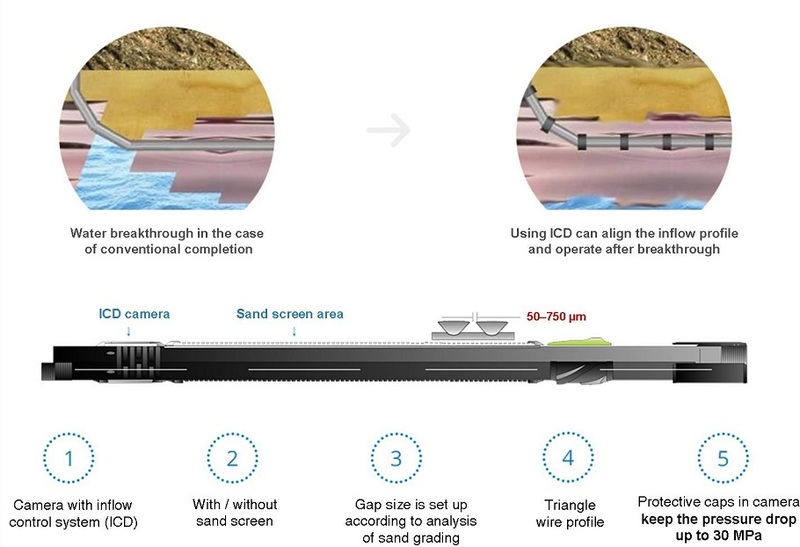 This conditions are analogue to operation of the device in the field with medium sand entry for 15 years. 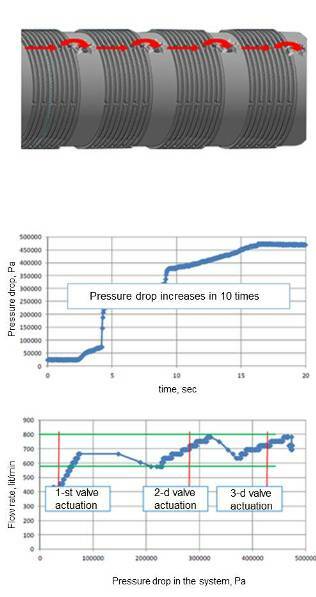 The system has worked very effectively, ICD functionality is confirmed by a significant reduction in gas flow rate without reducing of liquid flow rate. Gas-oil ratio (GOR) GOR depends slightly on the drawdown: an increase of depression more than one order gives GOR increase on 12% only. 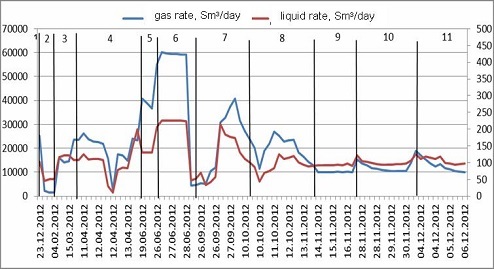 Oil flow rate has been increased on 43,2 % compared with previous surveys at flowing well by the same choke 23,9 mm. Separator gas production rate, water production rate and GOR have been reduced in 1,36; 1,40 and 1,95 times. WORMHOLES has developed software to simulate casing and liner running into the well - WORMHOLES TAD being software solution for integrated casing/liner running simulations. - predict the buckling and jamming equipment when running (Fig. 3). The software is successfully tested on the real field data. 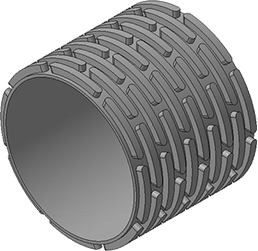 An important advantage of the software is the inclusion in the calculation of the flexural stiffness of the completion elements. of acceptable dogleg severity (usually manufacturers set the limit of safe dogleg severity ralated to stiffness around 3 grades per 10 meters) and other. Modern software simulators of completion are used for ICD configuring and adjustment, division a well into segments in accordance with the formation conditions. Correctly matched completion system with ICD allows to help in solving a wide range of well development problems using horizontal wells. The rate from the breakthrough interval increases sharply at water/gas breakthroughs because of higher water mobility. This do not allow to work other intervals. AICD automatically increases a resistance to the flow just in breakthrough areas (due to high rates from such intervals). It follows to pressure of such intervals and to help production from the other intervals. 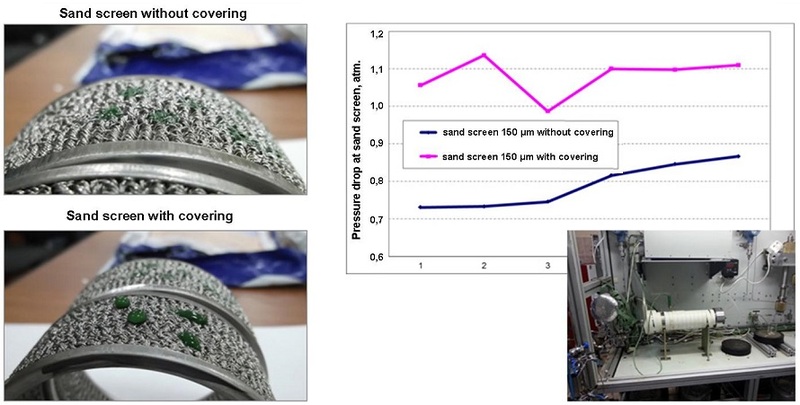 The special sand screen with covering is applicable to remove water breakthrough into a well when indistinguishable viscosities of oil and water. Such sand screen creates at a chemical level a greater resistance to fluid with high water content. Depression reduction at intervals with high water cut of 25 - 50% in case of sand screen with covering. 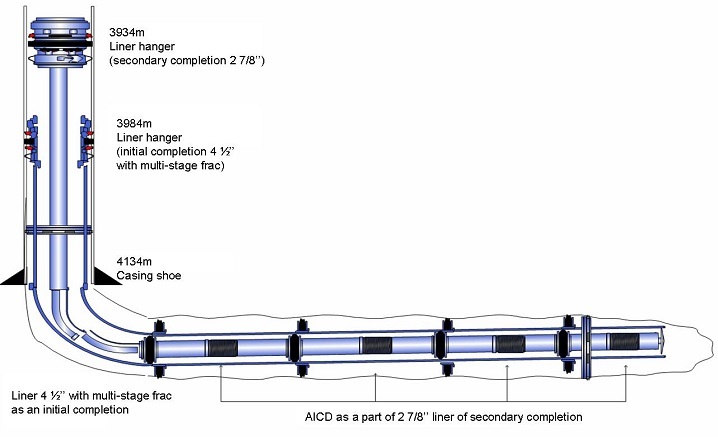 In this field case the adaptive inflow control system (AICD) 2 7/8’’ is installed as a secondary completion inside 4 ½’’ liner with multi-stage frac for inflow profile regulation, water breakthrough prevention and control of proppant backflow. In this case AICD limits the production rate for the each interval on a predetermined level. The growth of oil production for 1.5 years, t. Add. Income for 1.5 years, mil. $. WORMHOLES was created in 2009. The company established by professionals in oil and gas industry with extensive and versatile experience in engineering, scientific and field areas. In 2011 «WORMHOLES» together with «Tyazhpressmash» won the tender (competitors – Schlumberger, Baker Hughes, Weatherford) for the supply of completion equipment for horizontal wells on Yurubchano-Tahomskoe field (Rosneft Vostsibneftegaz). 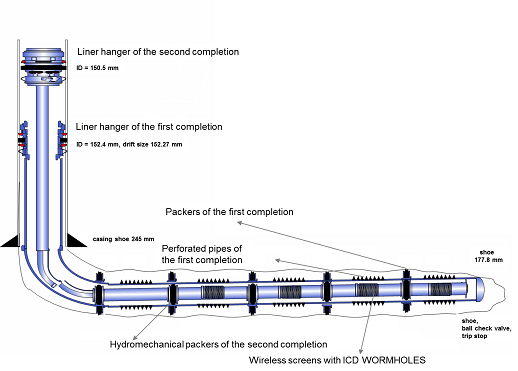 In 2012 «WORMHOLES» and «Lukoil Nizhnevolzhskneft» carried out the pilot project to test the an ability to limit gas inflow by means of «WORMHOLES» inflow control devices. The tests were successful. In 2013 R&D for «Lukoil Nizhnevolzhskneft» was conducted. The theme of R&D: application of Adaptive Inflow Control System (AICD) for Korchagina field. In the end of 2014 the equipment with AICD was installed in the well #11 of Korchagina field as a secondary completion (recompletion). The target was limiting of gas rate. In 2015 the positive results were achieved. Participation of «WORMHOLES» in "National Oil&Gas Forum", October 22-24, 2014, Moscow. 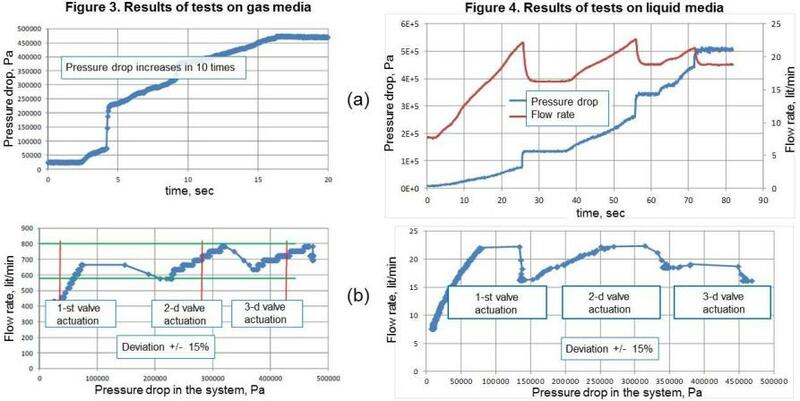 Volkov,Skibin,Zhuravlev,Nukhaev,Kyurdzhiev: "Investigation of characteristics of dual-position valve" // Chemical and oil&gas engineering // №12 2014, p. 27-30. WORMHOLES has decided to carry out research and development of new technologies as a resident of the Skolkovo Foundation. 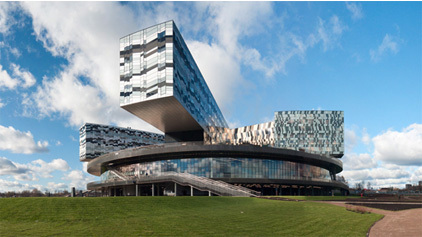 At the beginning of 2014 we got the status of a resident of Skolkovo. Our project in Skolkovo Foundation is “Complex completion systems and monitoring of oil and gas producing wells“. 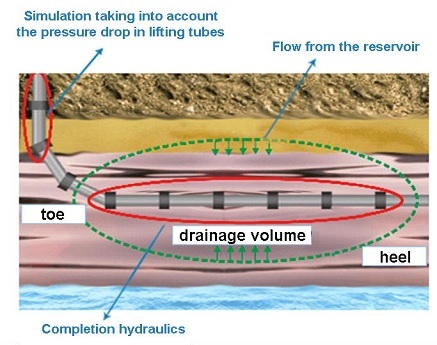 This project will be developed in the direction of an improvement of adaptive and intelligent well completion systems. We will work on the creation of new permanent monitoring systems and control of completion systems from the wellhead. 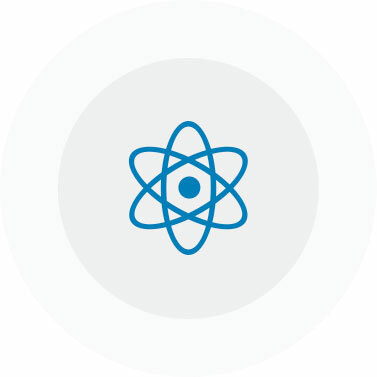 All products offered by WORMHOLES are produced and developed in Russia.